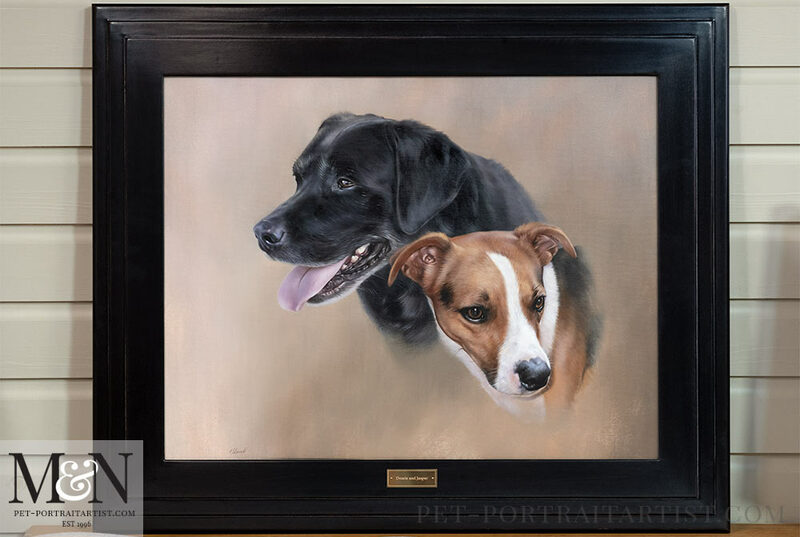 Welcome to our latest dog portrait of Dessie and Jasper. 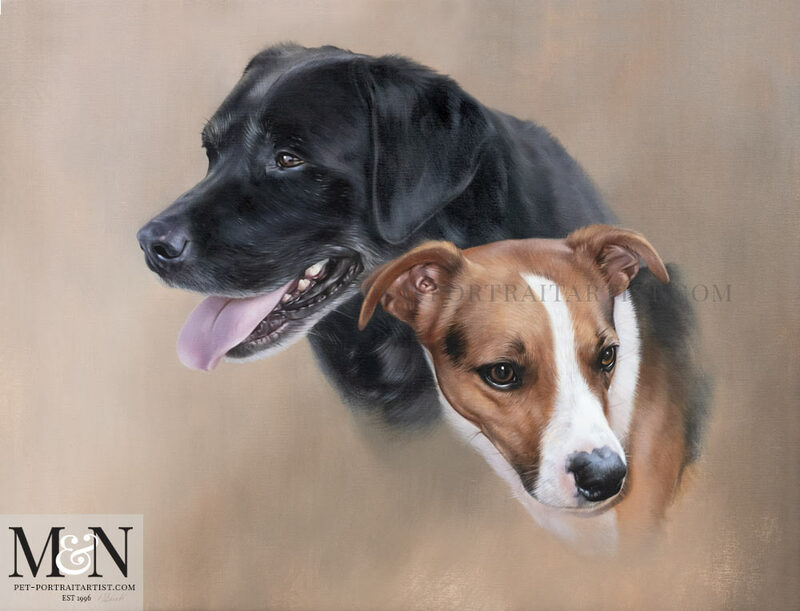 This portrait was painted by Nicholas at a lovely size of 28 x 22 inches. 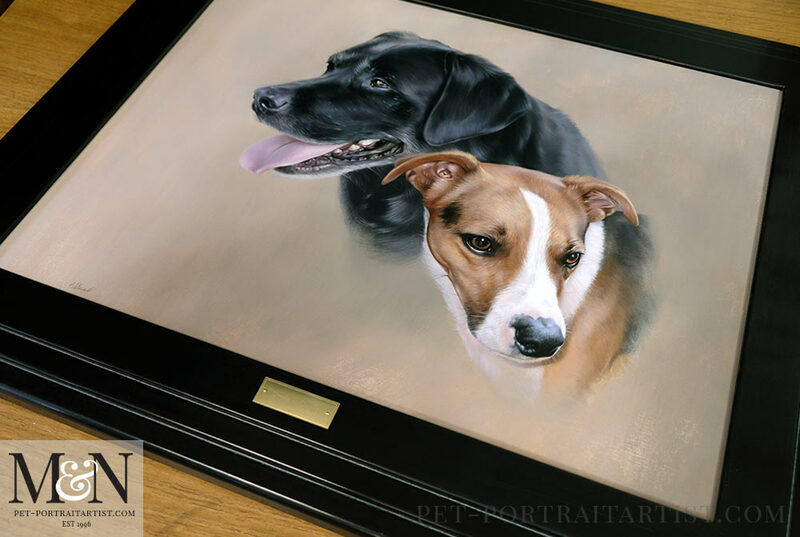 The oil painting was commissioned by a lovely client here in the UK as a surprise gift for his wife on her birthday. Sadly Dessie the Black Labrador had passed away, however Jasper is still going strong. The portrait will of course not only be a wonderful present for Johns wife, but for the whole family too. John asked if we would handle the framing of the portrait for him and we are always happy to arrange framing. 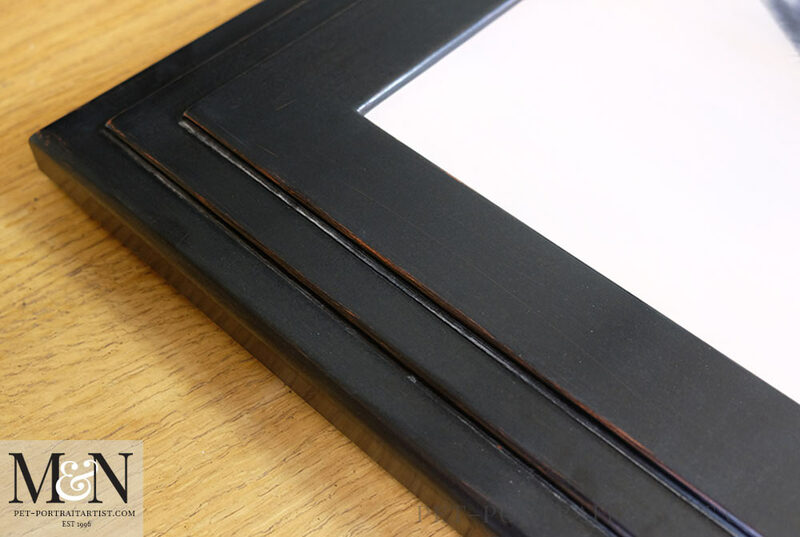 We have the most amazing framers with many years of experience between them, they handcraft and hand finish all of their frames and they are exquisite. John requested a very plain frame, without any detail or gold lines in. Our framers were very helpful in finding us the perfect frame and if you scroll down you can see lots of photos and some video of it too. It’s called the Hampton Frame and we absolutely love it. 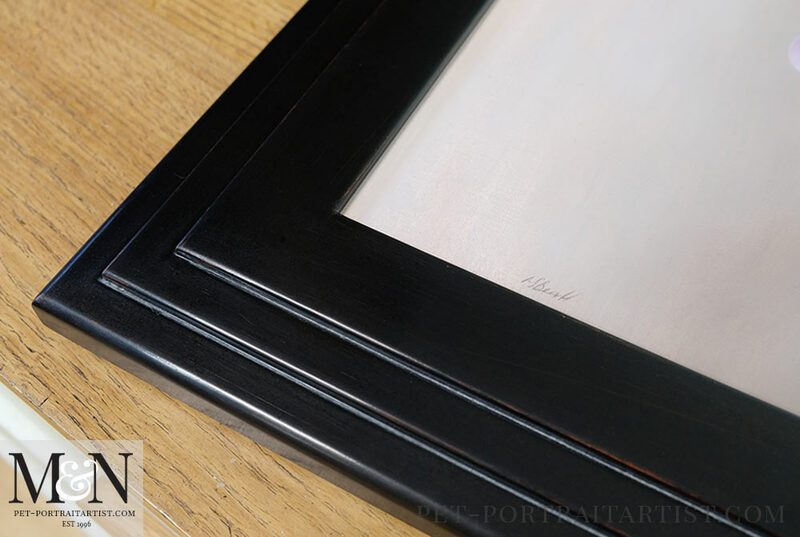 All of the frames we have commissioned from our framers are so smooth and silky to the touch. John also requested an engraved plaque which you can see in more detail below also. John was delighted when he saw the final photos…. The painting looks fantastic and can’t wait to see it for real. Nicholas has captured them perfectly. Dessie always happy and Jasper with that glass half empty look. I will call or email you when we get the painting and everyone has seen it. 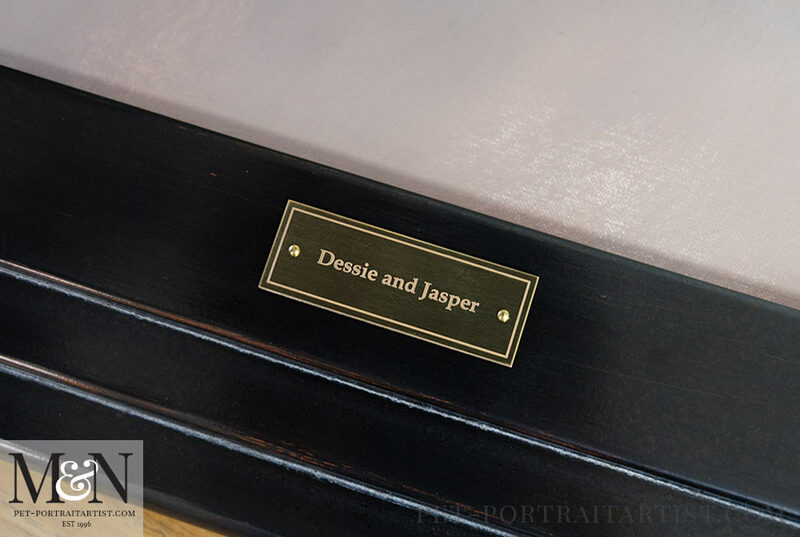 As you can see from the photo below Dessie and Jaspers plaque looks beautiful. It is a mirrored bronze plaque and is the perfect accompaniment to the portrait. Our engravers make each plaque bespoke to our clients requirements and if there is enough depth and not too much text, they create the additional border line around the edge, which finishes the whole thing off beautifully. We hope you like it too! 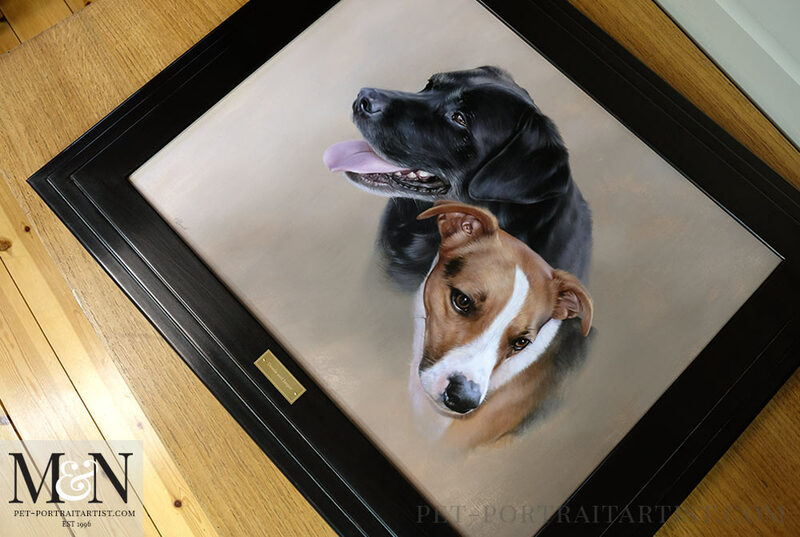 We like to take video of our new frames for our website and this video shows the portrait a little but mainly the frame and plaque. You cna see some close up in the video along with some detailed photos below too.